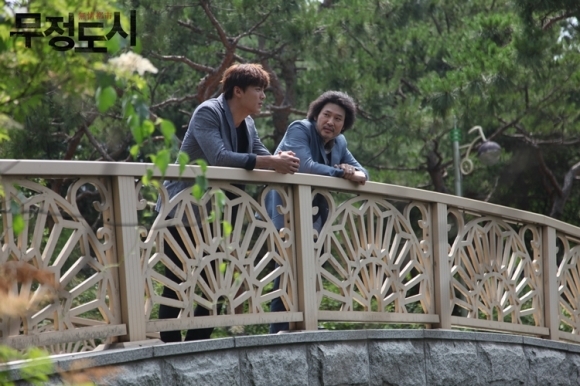 Shi-Hyun (Jung Kyoung-Ho) grew up in an orphanage, before running away from there. He then made a living by working as a drug courier and picked up the nickname "Doctor's Son." He's now the boss of a mid-size gang. 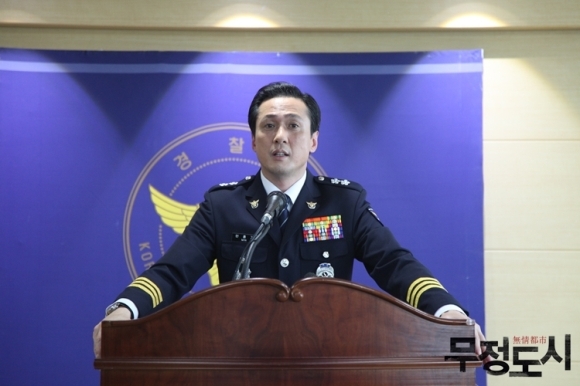 His drug supplier is a man known as Scale (Kim Byung-Ok). 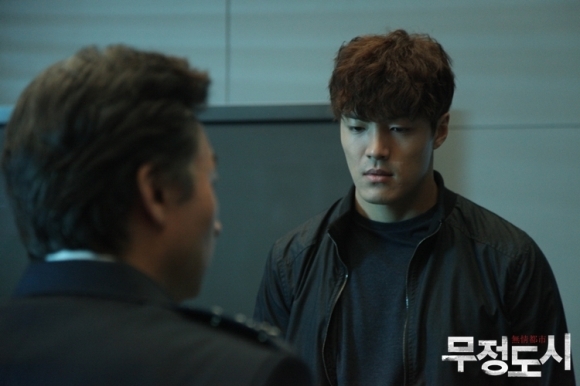 Shi-Hyun has plans take over his position. 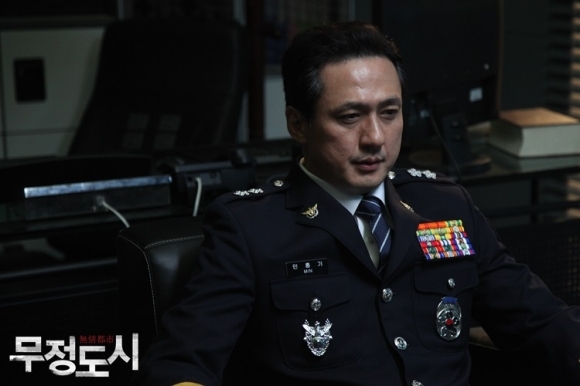 Meanwhile, Hyeong-Min (Lee Jae-Yoon) becomes the section chief of a special investigation unit. Their goal is to take down Scale, who killed an undercover officer. 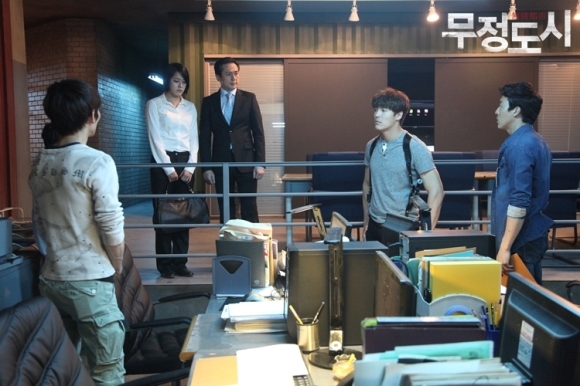 Hyeong-Min's girlfriend Kyung-Mi (Ko Na-Eun) is also a detective. She also grew up in an orphanage with Soo-Min (Nam Gyu-Ri). They grew up like real sisters and Soo-Min is now studying to enter the police academy. 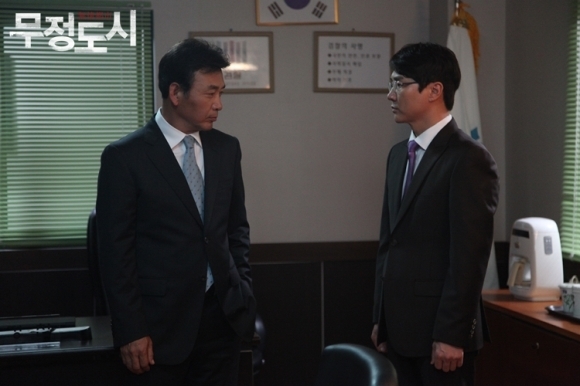 While trying to catch Scale, Hyeong-Min learns about a guy called "Doctor's Son." 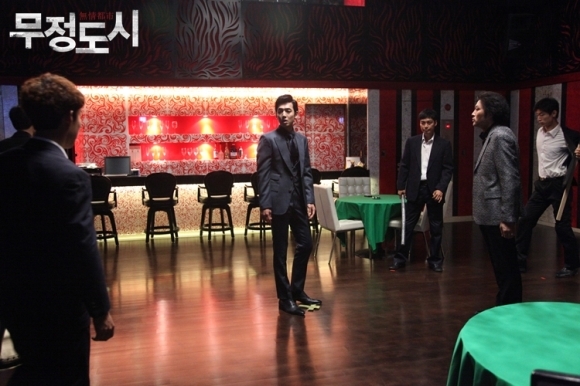 Now, Hyeong-Min and his team go after Shi-Hyun. 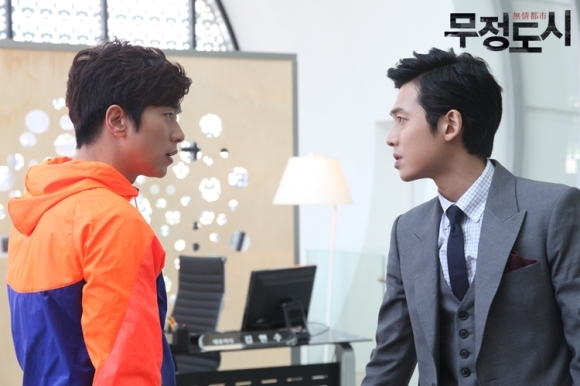 "Cruel City" takes over the JTBC Mondays & Tuesdays 21:50 time slot previously occupied by "Can We Get Married?" and followed by "Her Myth in July, 2013. First script reading took place on March 19, 2013. 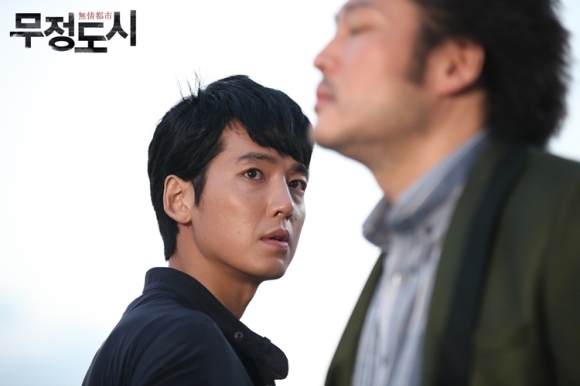 Early working title was "Undercover" then changed to "Moojungdoshi" ("Cruel City"). Krisstina May 14 2018 3:49 am Jung Kyoung-Ho was amazing as always! Such a great actor! Great drama, very emotional. Nasta Apr 07 2018 5:37 am Really good drama!!! So many twist. Great storyline+directing+acting. Superb! 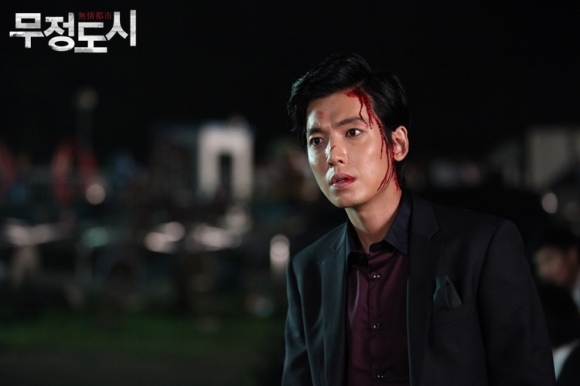 Hands up for Jung Kyung Ho. sasaeng_fan Mar 31 2018 9:04 pm One of the best action dramas of Jung Kyoung-Ho! Thrilling! whynot Feb 19 2018 2:06 pm excellent drama! Mary Jan 13 2018 2:04 am Such a great drama that hits me to the bones! Highly recommended!!!! Remarkable piece of work indeed! Deborah Nov 28 2017 3:32 pm I am thoroughly enjoying this drama. I have watched a couple of dramas with Jung Kyoung-ho, which is what brought me here. I am convinced he is an amazing, versatile, under rated actor. The assemble of actors for this drama, do a great job as well. Wonderful music score adds to the overall brilliance of Heartless City. First things first, hear the ost prior to watching this -it is one of best kdrama osts I have heard (and I have heard many)and it puts you in the right mood for this drama. The song "Hurt"will remain with you. The story takes some time to be set up but once it is done, it is a thrilling ride. Great twists abound in this game of betrayals, dual identities, unexpected love. One of the best action/drama/romance shows ever made. Kudos to the team. AJ Jun 14 2017 4:00 pm It was great, every episodes are worth watching for although I never expected that the ending would be that harsh still, it was amazing that it left me in awe and I definitely think that the ending made the story unique and outstanding. It would take a right measument of action, friendship, family, romance, trust, and conflicts to make such an enormous and one of a kind drama and I can say that Heartless City has it all. I have cried a lot, this gave me a really huge impact. Thumbs up! Maria Garcia Oct 23 2016 7:01 am I love Jung Jyoung-Ho, I first saw him in Beating Again, I love his acting as well as the series. I recently discover Korean series in Netflix and I'm hooked, love the special effects in Descendants of the Sun but moreover I like the acting. a male viewer Oct 21 2016 9:34 am This was an exciting one. It's dark, and i like that in a tv series. Overall, it's not very memorable, and the story is pretty simple. But it will keep you entertained throughout each episode, and it's sort of believable. I would expect the drug world to be like this. The male lead is very well executed, and it's hard not to have a shred of homolust for him. Reccomended. Suhos Wife Oct 02 2016 5:40 pm I just finished this drama. Man I cried a bucketload of tears. I have watched A LOT of kdramas and even though for most dramas, if trey have an ending I didn't like, I end up hating it.... not with this one. Yes I hated the ending but I loved the rest of the 19 episodes too freaking much to hate it all. So if you're hesitant about watching since you've heard we all hated the ending, watch it bc believe me you will not regret it!! This is a definite must watch. 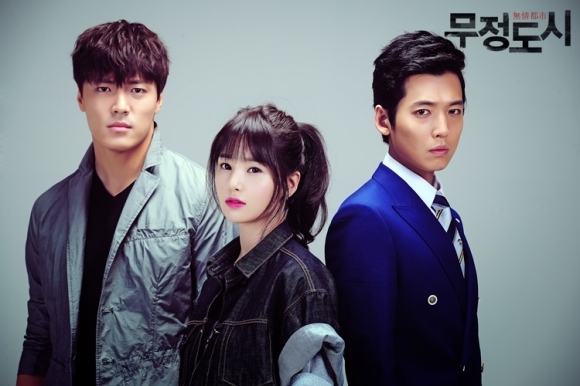 Migthy Thor Jul 08 2016 9:11 pm After seeing Lee Jae-Yoon did the swimming, judo and volleyball in the sports variety show Cool Kiz On The Block, I became interested in him as an artist so I started searching his movies and dramas and so I chance upon this one - heartless city. I have no regrets watching this drama. Very well done. For lovers of crime, suspense, action, thrilling, mystery and a bit of romance dramas, I highly RECOMMEND this HEARTLESS CITY! Brilliant story, Very Good action stunts, Artistic directorial job, and FABULOUS LEAD and SUPPORTING ACTORS - Jung Kyoung-Ho, Lee Jae-Yoon, Son Chang-Min, Choi Moo-Sung and Yoon Hyun-Min ! Mya Jun 27 2016 10:35 pm Or that min Hong-kin is the real puppeteer and he set all of them up against each other for personal gain or something. Marie Jun 15 2016 2:16 am Wow! 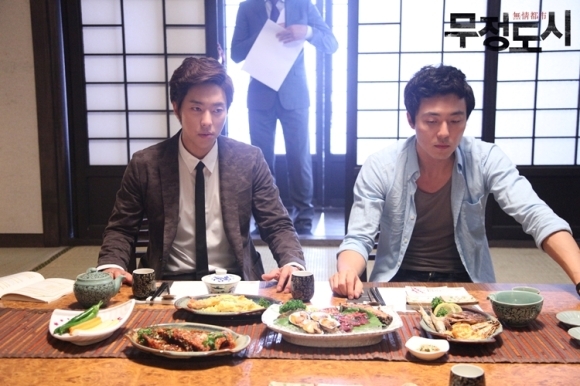 I really love this drama! It's amazing! Each episode are really interesting! The story is really great! This is the best drama ever! Second is Two Weeks! Thumbs up to the cast and production staff especially to the writer! I really like Jung Kyoung-Ho! He's very handsome and woman dreamed! He's really cute! The way he act he's really a man! I love him so much! I hope you can visit here in the Philippines! whynot May 28 2016 12:05 am very good drama. so different form the usual k-dramas. powerful performance by Jung Kyoung-Ho. yemi Ogabi Apr 13 2016 6:12 pm amazing movie such strong feels, i actually got bored of korean drama but this hooks me in. inlove with this movie crying bucket of tears ending was too much for me , damn. popo Mar 14 2016 9:35 pm his drama is soo good but i think it gets a lil bit draggy at towards the end. BUT do WATCH it . I like how they have romance but didnt focus to much on it. As for the ending its not a happy ending but its a GOOD ending. John Mar 10 2016 11:13 pm Fantastic series! Unfortunately, I felt the final episode was disjointed compared to the rest of the season. It felt rushed, unfocused, and as if they decided to redundantly kill off a few characters for the sake of closure, albeit one that was unsatisfactory in my view. Maybe i just wanted a happy ending. Everyone seems to have gotten the short end of the stick. I just finished watching the season, so maybe i am just annoyed at how they handled the ending. Sun-soo should have shown up and taken revenge, thus saving our beloved hero from his fate. Pchan Feb 22 2016 11:23 am Best drama ever, great story each episode from ep 1 till finished , love it. 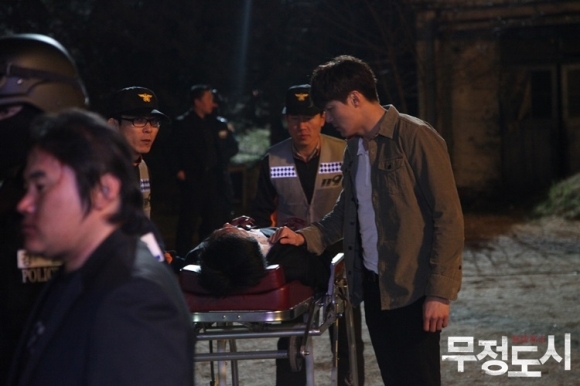 Rynia Feb 14 2016 9:28 am What happened to kyung ho in the end? It is happy ending or not? i like kyung ho and watch his drama if he be a hero. Mariana D. Dec 12 2015 3:18 pm I lived every moment and cried like crazy at final. It's one of my favourites drama ever. And I'm a big fan of k-dramas and watched a LOT of them. kaya Oct 18 2015 3:52 am I vote this the best kdrama. Congratulations to the actors! Ebial Oct 03 2015 1:41 pm This is why I don't watch this kind of apocaliptic dramas...don't watch if you don't like to cry... But I watched because of the romance..and kinda dissapointed to be true, angry too...honestly, I wouldn't watch it again but whenever I'll remember it or listen to the OST I will cry. This was a good drama but my heart wasn't prepared.. So as a reference...not trying to spoil but if you don't want to waste ur time to get angry and dissapointed and sad in the end don't watch. If you don't have any drama on ur list and u're bored, watch it..after one or two eps u will get addicted. abigailbasao Sep 06 2015 11:00 am OMG! 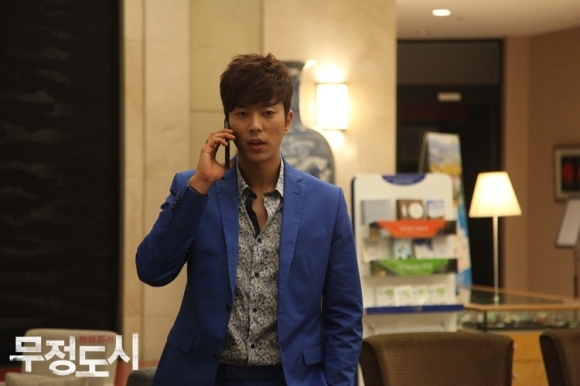 getting addicted with kyoung ho after fall in love with soon jung! ts like all his dramas and movies and interviews id like to watch them alll!!! whoaaa!!! hahahaha whoaaa!!!! Josh Sep 06 2015 12:16 am Oh I love the cast, the dynamic, the flow, this drama is a true emotional roller coaster! The amount of killing is top of the line and the bad guy is really bad and wicked to the point that you want to punch your screen straight on. And the heartbreaking scene makes me so mad that I literally punched everything around me. 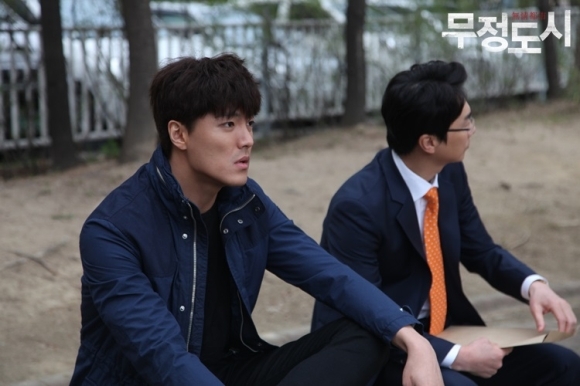 Season 2 please jebal jebal jebal! Bernadette Aug 06 2015 1:35 pm Awesome Drama. Should have won multiple awards. Those that vote for Drama of the Year is crazy for not voting for this one. Soundtrack is the bomb! Daniel Aug 03 2015 7:42 am Awesome but sad so many people sacrificed and dead (even doc son assistant/driver that went as undercover and pitiful scale who did a big 360 turn to help doc) in the end. Big question mark that never explained is what kind of affection or love that Jin-Sook having for Shi Hyun? It is not blood relationship so I am guessing between men and women? What kind of realtionship in the past for Jin-Sook and Min Hong Ki in the past? Moon loved Jin Sook for sure lol she such a female fatale. Kim Na Na Jun 28 2015 9:47 pm WOW! What a great drama! Every episode is so exciting! OMG! Couldn't stop watching! The lead characters acted so good! It's cool that Soo and Shi Won acted in the new drama "Falling for Innocence" again. ^^ I don't think there'll be a 2nd season, since Shi Won died. mariankata Jun 18 2015 7:01 pm The drama was awesome... hope there is a second season. But what really happened in the end??? I am going crazy over the light suit scene!!! Pat May 31 2015 10:59 pm I adore it, addicted to it. Sooooo much! Request 2nd season ! rouge Apr 10 2015 4:06 pm if there is anyone who knows a drama similar to this, please let me know. Rouge Apr 06 2015 12:26 am This is the first drama I have watched in my 20years that no matter the ending I love it to death. I usually REALLY hate dramas that have this kind of ending (no spoilers sorry, it's really good tho watch the drama), but I swear no jokes -serious face- this drama is something you can't hate. SO just know that I hate dramas like this but i don't hate this one and I have watched it a total of 3 times, plus re-watched all of it today even tho i have exams. This drama is intense, emotional (a great deal), romantic, and omg the action <3. 1000x better then city hunter personally. THIS DRAMA IS DARK AND INTENSE! BEST DRAMA EVER WATCH IT!!!! batrizy Feb 13 2015 8:07 am I think sans Kyungmi, this drama should left out the romance. The supposedly love between shihyun and soomin seem do sudden and out of nowhere, atleadt develop their feelings better. Watching it for the bromance & Soo colorful suits. the killer Eunsoo character was so messed up in later episodes. I mean we get it that she's been forced into sexual acts with Director or is it Chairman Jo but why the sudden personality change. I also hated how the antagonist would always lost to the main cast, I mean one skinny Dov vs 10+ people. And don't make me rant on how slow Eunsoo get so slow after being mauled by Doc in the face and didn't contact Safari or Meth Kim. Jinsook being a better fighter than Eunsoo is also ridiculous, sure Jinsook a drug ringleader and street smart but Eunsoo made her living as a killing and have beaten numerous gabgster by her own (unlike Jinsook who depends on her bodyguard or Doc(. But the biggest mess in this shows is Soomin closet. High heels during a mission, and not even the chunky heels or wedges type. Fizza Feb 07 2015 9:45 am It was one of the best dramas i have ever seen but there is one thing i am against why they killed doctor's son at the end...I was so disappointed after watching the last episode :( ... Why does most of the Korean dramas don't have happy ending?? lenimoz Aug 29 2014 4:33 am One of the best Kdramas I've seen. Fantastic story, cast and one of the best soundtracks I've heard in a really long time. 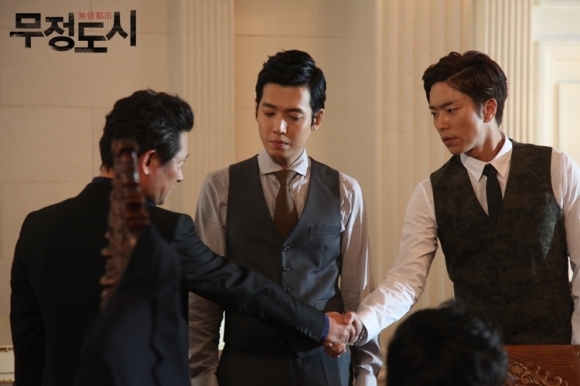 Jung Kyung Ho, Kim Yu-Mi and Choi Moo-Sung were really believable and can make you feel their emotions. I really reccommend to watch it, you will not regret it. scb Aug 22 2014 11:10 am This was an under-rated but out of the ball park home run of a drama. Cruel City is one of my all time favorites. The screenwriter Yoo Sung-Yeo hit a home run with this drama. Yoo Sung-Yeo created a strong and intriguing plot-platform that any actor delivering the lines rote, would shine, but having Kyoung-Ho, MooSung, and Hyun-Min just shot the quality to the moon. The camera work and the choreography of the fight scenes made you feel the intensity (ducking and cringing). The attention to detailing the underbelly of the drug world (at times) felt more like a raw undercover documentary. The emotions of all the actors were true, visceral and convincing, Jung Kyoung-Ho was fascinating to experience his emotions come across his face, accemt that with his suave graceful demeanor (007 debonair) and Lord have mercy I was 100% immersed. This is a must watch, one of Kdramas best. I will be looking out for more works by this author. @nd season plz. Shay Mar 07 2014 8:21 pm An AMAZING drama! Great actors! Jung Kung Ho has got to be one of my favorite actors. Reira Feb 22 2014 6:29 pm This is undeniably one of the best dramas I've ever watched, it has everything: the story, the characters, the side characters, the music, the filming techniques... It was an extraordinary experience, from start to finish. Btw, the end is neither happy nor tragic, but rather half realistic, half mysterious. 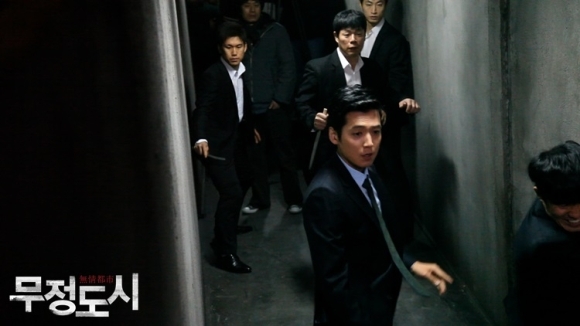 It's a drama I like to compare with Time Between Dog and Wolf and even Infernal Affairs. Genius! Gage Feb 21 2014 11:55 am Best kdrama ive ever seen. Only a few parts of the acting on gyu ris part could of been a little better but it was fantastic. Moo sung was so dynamic is this show. Great story. As much as I wish the romance side was a bit better, id rather have a great overall story then a story buried under puppy love romance. dadz Jan 04 2014 9:51 pm . . . .actually, when i first watched it, i think i love it that much. but i was wrong . . . .i couldn't wrap my mind from the flow of the story . i think the writers have overdone the story . .its so stuffed of problems. i just don't like it .but it's worth a try though . . .
Lizzy Payne Jan 04 2014 4:36 pm This drama is GREAT seriously ! When I was at the middle of the drama, I came and read the comments of others here... I was disapointed cause I don't really like sad endings... but I was allready addicted to it xD this is one of those drama you watch even thou you know the end of it ♥ Give it a try ! You'll not be disapointed ! Amanda Nov 14 2013 9:26 pm Wow... Just one of the best of this with Queen of Ambition and Secret, it was very catchy and have an excellent cast. I hope a second season. Drama101 Nov 10 2013 5:32 pm At first, I started watching this drama because I had literally nothing to do during the holidays and I had already downloaded this series. In the first episode, I was like okay, why am I watching this? Then I slowly, but surely got intrigued by the plot so I started watching it more intensely. By the end of the second episode I was bewitched by how fascinating the whole show was that I watched it day and night! I haven't finished watching it yet, but it definitely was worth watching so far! The only sad thing was killing off Kyung Mi at the beginning of chapter 4 :( I miss her! Sunny Oct 17 2013 7:17 pm Every second of this drama was worth watching. There was never a point I felt bored. I anticipated every second and once it ended, I felt a bit empty despite all the emotions that swept over me as I watched this series. I wanted more of Jung Shi Hyun, Soo, Jin Sook, Ji Hyung Min, and Moon Duk Bae. They were the ones who left the deepest impression on me. I didn't care much for the romance because this wasn't what the drama was about, anyway. This drama was amazing. It was heartbreaking, yet I still love it. Remeechan Sep 30 2013 4:19 pm Awesome,, Amazing,, Daebaaak ~~~ Totally recommended. angie Aug 16 2013 9:42 am the only word to describe this drama is ''amazing'' this is indeed the best drama of the year. i read from reviews about the tragic ending, for the first time it didn't stop me from watching. this is a must watch for all. amazing amazing and amazing. xrutti Aug 14 2013 7:24 am I wish to see season 2 , but with the main guy too!! sweetdramas Aug 13 2013 3:29 pm I wish there was season 2, BUT is has to be the main guy though or else....Hm....? idk if i'll watch it. sweetdramas Aug 13 2013 3:27 pm OMG!!!! this has got to be one of the best drama ever!!! I don't really like dramas with drugs and gangster. No matter what I just can't keep up at with it. My attention span is probably up to 2/3 eps, but dang! this one was awesome!!! paper Aug 08 2013 11:15 am I love love love loved this drama :) Totally recommend it to all. I don't get why people are calling it a "melodrama" but its far from that~ its so much more. It is by far the best kdrama I have watched in 2013. The plot was so tight, the characters were superbly utilised and the acting & directing was FANTASTIC. For people who are craving something to fill the empty void check out Banshee (US tv-show) & Two weeks the new kdrama. Anywho~ the only thing that I didn't fully enjoy was the last episode... oh and all the censoring BS that went on (there better be a fracking boxset of this coming out for me to purchase! preferably blu-ray release~ i'm even willing to fork out money for the super expensive japanese release [prays to the powers that be that there will be one]). I'm all for what they did but it would have been more meaningful if they gave.... the proper sendoff. Then again I think they pulled a Vampire Prosecutor on us and all is well with the world. I really hope thats what they did... it sure as heck looked/felt like it. Oh and this show is best watched in one go~ you really really really need to have all episodes on hand otherwise you will be pulling your hairs out ;o Oh and have lots of tissues on hand and Hot chocolate or preferred alcohol of choice. pearl Aug 06 2013 6:33 pm JKH became "Polat Alemdar"! gora Aug 02 2013 11:35 pm This is the best drama for 2013. Its my number 1 korean drama of all time! Love it for JKH's superb acting. Love it for the great actors, cinematography, tight directing. Over all what a wonderful drama. Absolutely fantastic. No words can describe the beauty of this drama!!! Thanks jtbc for giving as a drama of superb quality! LOVE IT! addylovesbwood Jul 31 2013 6:04 pm Hope it's not too early to call this 2013's best drama!! Lena Jul 30 2013 5:46 pm Heartless/Cruel City was DAEBAK! I just wished they had made the ending stronger because Shi-Hyun had suffered so much. I felt he deserved better! Hopefully a CC Season 2 but has to be same characters. Desire Jul 30 2013 5:18 pm Tonight, I finished watching two nice dramas –SHARK and HEARTLESS CITY- they both had nice stories and ended up so sad but also lovely. I really feel good when the dramas I love most end in a way I enjoy. SAD or HAPPY ending doesn’t matter for me, I just care about how my beloved heroes may end up. Kim Nam-Gil (Yi-Soo), Jung Kyung-Ho (Shi-Hyun) and Yoon Hyun-min (Hyun-Soo) acting was superb and touching. The ending leaves alot of questions. The writer shouldn't have ended it like that. So many deaths!!! And *spoiler**********our favorite character too. Doc. Laura Jul 20 2013 5:30 pm This drama is awesome , ı love watching it but ı need more romance please :) I was waiting a love triangle (between soo min hyang min and shi hyun) but it won t be happen I guess :( Last 4 episodes and I have a hope to see more romance. Crime crime crime when it s will be end ? Lana Jul 18 2013 5:25 pm I loved this drama! 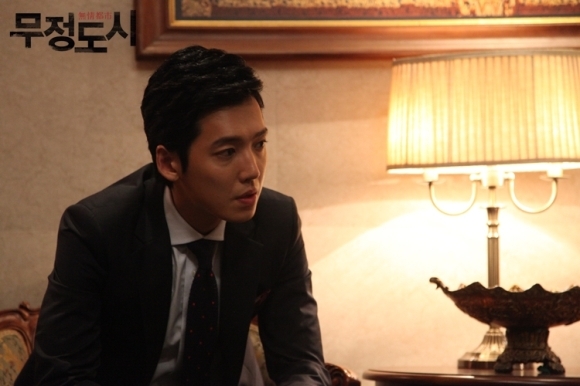 Jung Kyung Ho is the best actor ı have seen ! I watched him in Smile.You too . But in this drama he is really different and cool. Nam Gyu Ri I loved her acting too! (I wont say something about her beauty because everybody Knows it) Best couple ever . They havent have many screen times like another kdrama couples but them chemistry , ıt makes me addicted to this drama. Last 4 episodes. I would more screen time for this couple please! CICI Jul 16 2013 9:54 am I LOVE "CRUEL CITY"! It's exciting, has gripping twists and turns, fantastic acting and the best music ever!! If you like action balanced with mystery, emotion and some great martial arts scenes from Jung Kyung Ho, I think you'll love this as much as I do. I also think that Nam Gyu Ri was perfectly cast as an inexperienced undercover cop and she is beautiful and "believable" in her acting along with so many others. I look anxiously look forward to each week's episodes. Nam Gyu Ri Jul 13 2013 3:59 pm I started this drama because of Nam Gyu Ri. I thinking like that:Eventually smart woman in korean drama. But I was disappointed. Writer doesn t care her character. 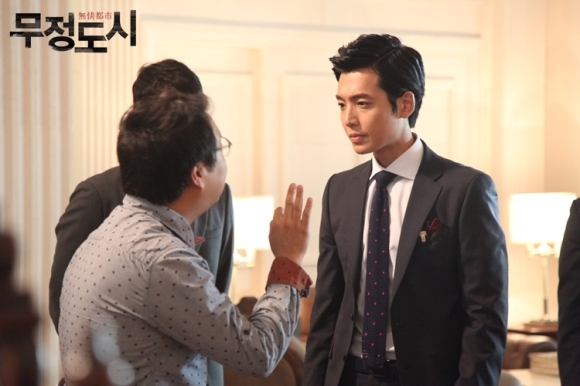 Just ı want to say something, lead role is not just jung kyung ho. I want to see smart yoon soo min. Whatever, still like this drama . Nidnoi Jul 08 2013 9:13 am Great drama of the year 2013. 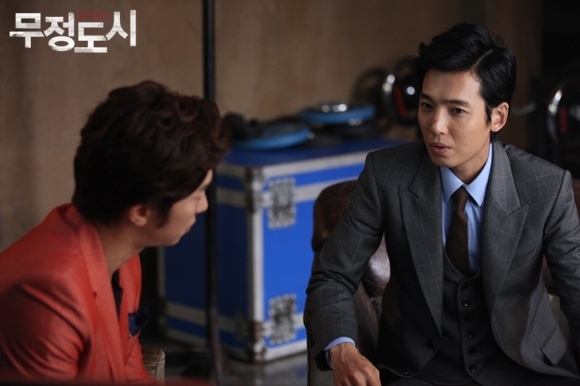 Jung kyung ho is so awesome. His acting is really great. In the right time he can choose the very good drama when he came back the military. I hope he will choose the good drama for his next role like this. nice Jul 04 2013 9:24 pm I just wish they can extend this drama with 4more episode that will be very enjoyable, for a long time i have never feel like this about Korean drama.hope for a happy ending so that when it ends i can come back and rewatch it again. good for you screenwriter I think you know what you are doing just give us a happy ending that will keep this drama a memorable one,which you can always recommend to any one who wishes to watch a good drama, please no sad ending. Thandy Jul 03 2013 9:12 am I absolutely love this drama , can't wait until the next episode . The lead is so awesome. Ceyda Jun 24 2013 2:09 am I loved this drama. I really want to see love of yoon soo min and Doc son. We have to watch this drama. Ceyda Jun 23 2013 1:18 pm I loved this drama! I think this drama is the best korean drama. Because it is really different from others,we can find everything in life in this drama. 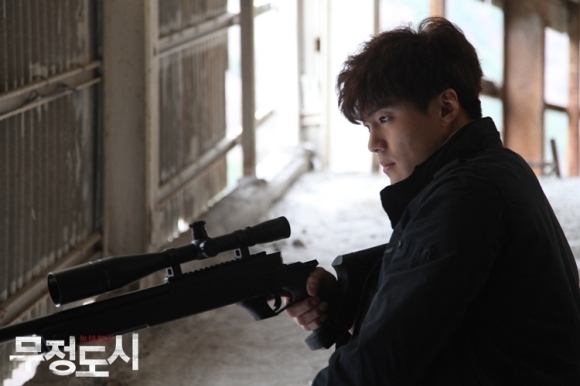 gerald Jun 21 2013 1:30 pm This the one of the best drama of 2013. Maggie Jun 20 2013 10:55 pm Didn't think I would enjoy Cruel City, but boy was i wrong! It is absolutely fantastic with all the plot twists and the incredible acting! A must see! elicit Jun 12 2013 6:35 am This show is on a whole 'nother level! Lee Re Na Jun 12 2013 12:36 am One of the best dramas out there. Seriously, I never thought I would enjoy this drama so much until I finished the first episode. 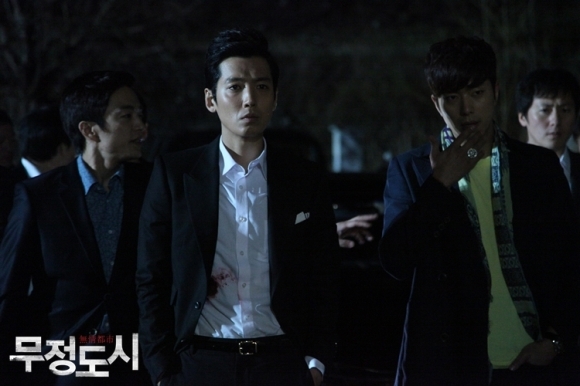 The best thing about it, is that it continues to be entertaining, you never get bored, plus Jung Kyung-Ho is so hot and badass. I love the fact that this drama is so different then any other drama I've watched. 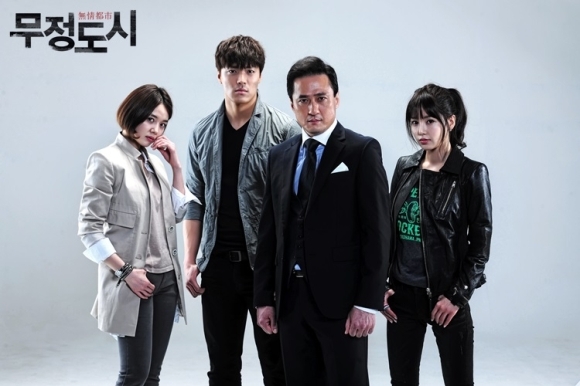 I am seriously obsessed with this drama and can't wait for the new episoded! eun won Jun 08 2013 4:44 pm i like the ending song, what the title of the song? DC Jun 08 2013 11:17 am This show is amazing. It's on a whole different level. It gives you a different feel and vibe. I feel like even if this show didn't have a romance angle Doc son would have carried it all the way. This drama best of the year. Best Kdrama in my opinion. Anso Jun 08 2013 8:29 am Whats the song At the end of the episode.??? Could someone tell me the name ?? Thank u.
ixtyjjang Jun 07 2013 7:20 am Waa~ I'm shipping Kyung Ho - Gyuri couple now. They're too cute on instyle photo shoot. 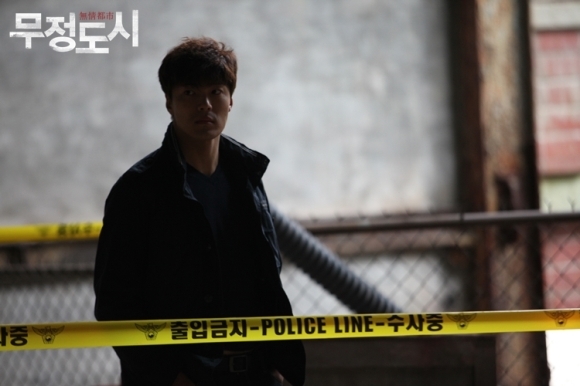 ohminji Jun 03 2013 3:49 pm Anyone know the name of the ending theme? It's so good! 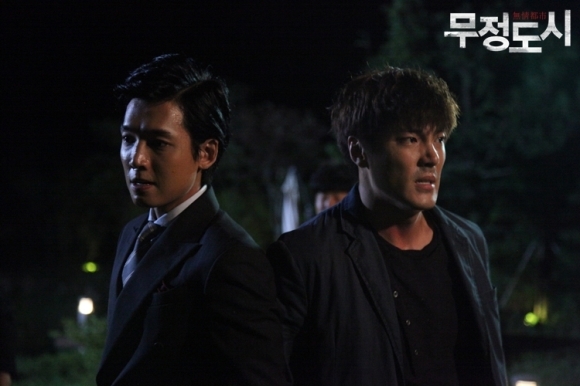 Hwa May 31 2013 9:19 pm Just watched the first episode and whoa.. I'm in awe! great acting! ixtyjjang May 30 2013 11:06 pm Watched Heartless City Episode 1 & 2 for @kyurin1022 Gyuri unni. All in all I saw her 4 times, 3 times in 1st episode including preview and once in 2nd episode preview. I'm getting impatient to see unni already. shopie Apr 26 2013 3:06 am my prince charming!!!! !